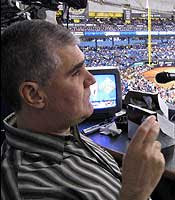 Enrique Oliu (pictured left), the Spanish voice of Tampa Bay Rays baseball, was born blind. But that has not stopped him from fulfilling his passion. An October 1998 Associated Press article said that the then ten-year old native of Nicaragua he was sent by his parents to attend the Florida School for the Deaf and the Blind in St. Augustine. A communications major at the University of South Florida, he got his first crack with the Jacksonville-based Montreal Expos farm team. In 1998 the Tampa Bay Devil Rays made the call, asking him to be the color analyst of the team. Via Daryn Kagan, here is a video from CBS News about his story. It may not really be that much of a stretch, given that Ronald Reagan did baseball play-by-play from a radio station based on wire reports. You can hear more about his story from the WUSF radio series Stories from Winners. Thanks to Daryn Kagen for posting this video this morning.